You are here: Home / What is there more of? Is your child completely unfamiliar with math? Maybe she doesn’t even know how to count yet? Excellent! That means she has the opportunity to make real discoveries, and our job is to pose the right questions to her. Even if your child can count, “one, two, three...”, it’s likely she just memorized the numbers. But memorization doesn’t help to get a sense of what quantity means, or to understand the concepts of less and more. Below you’ll find different games to play with your preschooler to help him or her develop this sense of quantity. Your child will puzzle you with her approaches, and not all of them will seem “right.” Be ready for this and don’t correct her right away, as that might undermine her confidence. Try also not to tell your child exactly what to do - the answer itself is not as valuable as the road to the answer. Trying, daring, and pushing the limits is the way to learn! 2 baskets of apples, box of cookies or any other suitable food that you have in the house. Guests! 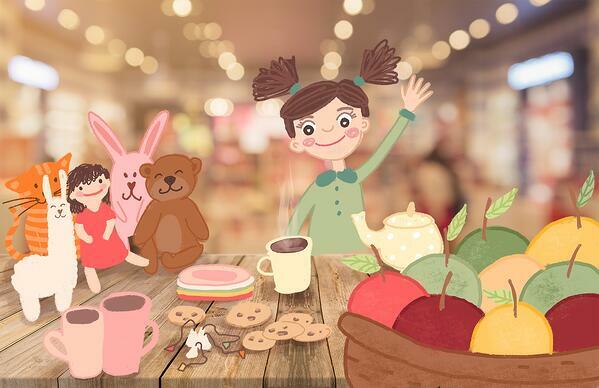 Let your child choose which toys he or she would like to include in a tea party (the more, the better, so that she doesn’t think to count them outright). Tip #1: It’s important that your child does not count the plates mechanically, but rather matches them to the toys: “This one is for the teddy bear, this one is for the doll,” and so on. Encourage your child to try a different approach if he or she starts to count. Tip #2: Your child will surely think to put the bags in the mugs, since it’s natural. 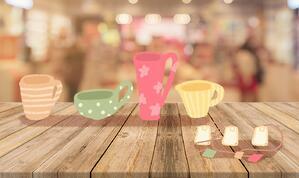 Leave a few mugs without bags, then ask your child whether there are more mugs or bags. Tip #3: Not counting in this example is hard. But let your child discover another approach. It seems like the problem is the same, but placing apples from each basket side by side is far less obvious than putting tea bags in mugs. Make sure not to rush your child, she might surprise you with some creative idea. 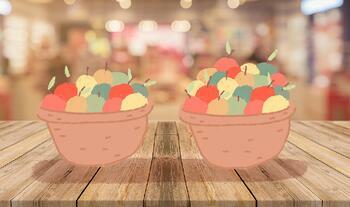 After a method of comparison has been invented, make sure to ask her which basket had more apples. Once it is done, you can give your child a trickier problem: put the apples back into the baskets so that there’s the same number in each (you can eat the remaining ones!). Game #4. Now for an interesting experiment. It seems like your child has begun to master the method of matching. Give her another simple problem: put several apples in two rows. Make sure there’s the same number in each row, but in one row the apples are next to each other, making the row short, and in the other they are spaced out, making it look longer. Ask her which row has more apples. Tip #4: Don’t be surprised if your child doesn’t begin to match apples in each row, but rather immediately says that the second row has more. In that case, simply move the apples in the second row closer together. “What about now?” Your child will have to admit that there is the same number of apples in each row. Turn her attention to the fact that you didn’t remove any apples from the second row, just shifted them a little. It will be very interesting to see how your child responds. Game #5. Finally, a very hard problem: the plates are ready for all the guests, the guest are coming soon! 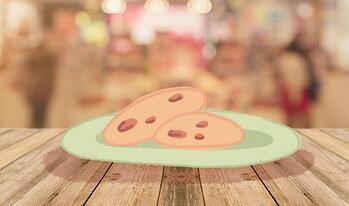 Let’s put cookies on their plates. 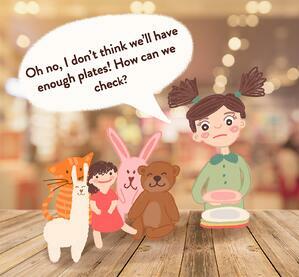 We want to be fair to everyone; how can we put the cookies on the plates so all the guests get the same number? Tip #5: It’s impossible to predict how your child will react--there are countless possibilities. As long as the problem is still interesting for her, don’t stop her or give her hints, even if you think her actions are illogical. We hope both you and your child enjoyed the game, the exploration, and of course, apples and cookies! If your child wasn’t able to figure out one of the problems, simply come back to the problem later. We’re not in any rush; our goal right now is not to give your child algorithmic solutions, but merely pose these questions to her, and to develop understanding and thinking! You can easily come up with analogous problems of comparing by matching and giving them to your child anywhere. You can play with rocks and seashells on a beach (“Look how many rocks I have. Can you find as many seashells?”) or acorns and leaves in your backyard (“Try to put a leaf under each of these acorns. What is there more of, leaves or acorns?”). Use your imagination, and have fun playing with your child!